Note: Cornell Pump Market Managers provide periodic articles to the blog, to discuss issues and developments and pump. The articles are meant to be more conversation and less technical, while still explaining important pumping concepts. In this edition, Cornell Pump Agricultural Market Manager Bob Jansen discusses differences between packing and mechanical seals. Packing is the traditional method of stopping leakage around the drive shaft of an end-suction centrifugal pump. Rings of braided, fibrous material, such as graphited or non-graphited acrylic, PTFE (polytetrafluoroethylene or Teflon) or other materials, are “stuffed” into a pump stuffing box (or seal chamber), located in the pump backplate, around the outside diameter of the pump shaft, to reduce the high pressure developed in the pump case, and decrease the amount of pumped medium that is forced out of the pump along the drive shaft. Packing does not stop all leaking, however. Packing rings are kept just loose enough to allow a trickle of liquid to seep out during operation, which accomplishes the flushing action necessary to prevent overheating and excessive wear between the inside of the packing surface and the outside diameter of the drive shaft. Advantages of using packing normally include lower upfront cost, availability, simple installation and is replaceable with minimum down time. The disadvantages of packing are that it needs to be monitored and adjusted, as required, to maintain a slow drip (40-60 drops/minute) to cool and lubricate the area. In addition, the area surrounding the pump needs to be able to handle the small amount of constant and necessary leakage from the packed stuffing box – such as removing the liquid from the area, etc. Packing is available from most manufacturers in pre-formed sets for each individual model, or in bulk form. Various materials are available to match the requirements of nearly every application. Mechanical seals are another common method to seal this area of the pump. They consist, in their most basic form, of two flat faces (machined within light bands tolerance): a rotating element that spins with and seals the pump shaft, and a static element that presses into the backplate casting and seals the liquid from escaping to the atmosphere. The central advantage that mechanical seals possess over traditional packing is that they almost completely negate all forms of leaking in a pump. (A small amount of liquid vaporizes as it crosses the seal face, but is usually not noticeable). 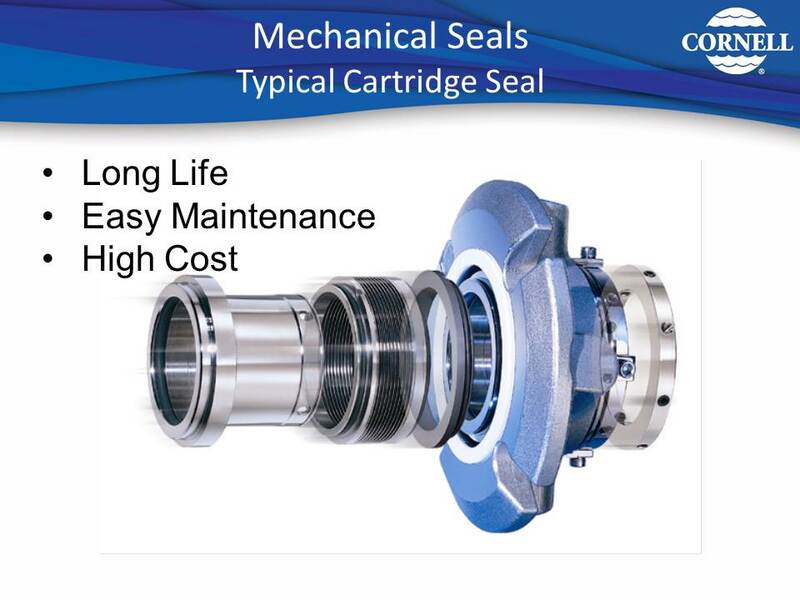 Less maintenance time is required with a mechanical seal during operation, as packing must be regularly inspected and adjusted/replaced, whereas a mechanical seal operates, without attention, until the seal faces are badly worn. Mechanical seals come in a number of possible configurations and materials for different pump types, medium pumped, pressure ranges required, etc., but for this post we will only mention the two overarching categories of single and double seals. As with all mechanical seals, they require careful and informed installation, but once properly set in place, they require no additional adjustment or maintenance. Mechanical seals often present more upfront cost than packing – sometimes considerably more. However, because mechanical seals usually offer less downtime and maintenance than packing, they can save money over the life of the pump. 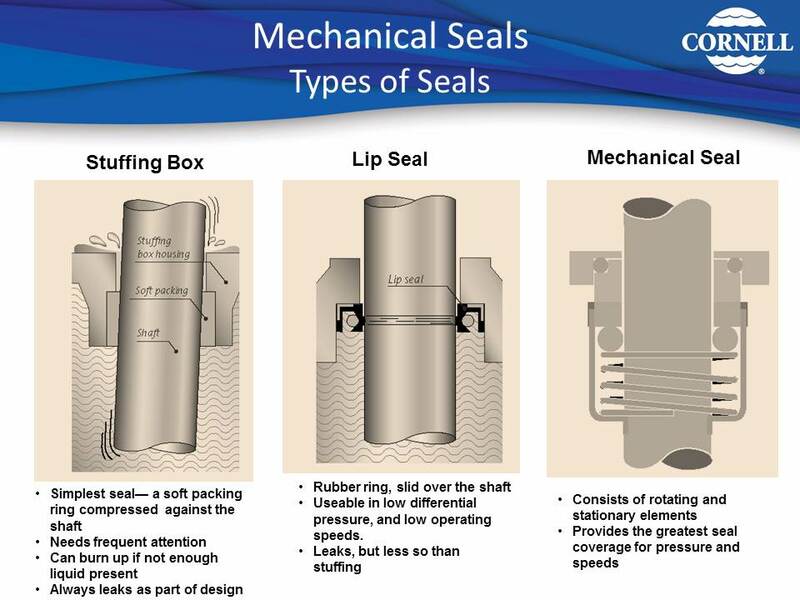 Seals are also less tolerant to shaft deflection and misalignment, and dirty or contaminated medium. 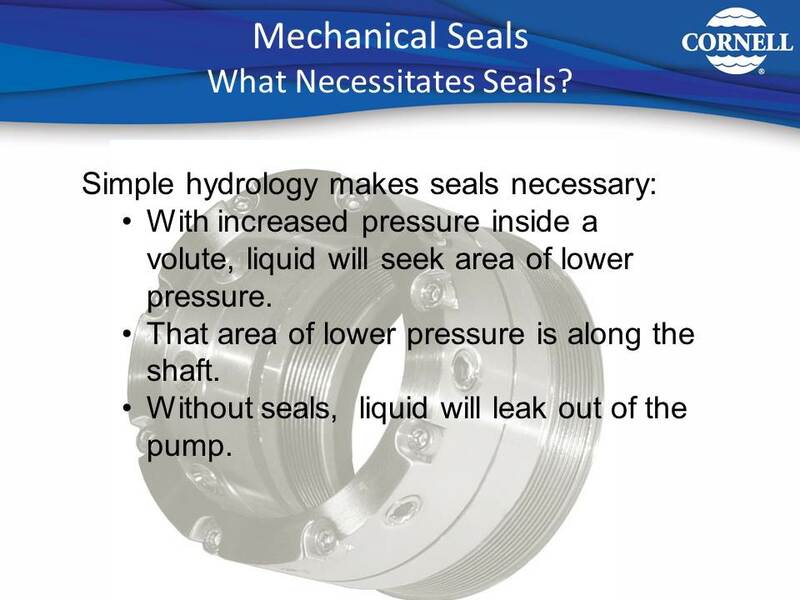 Since mechanical seals require a thin liquid film to properly lubricate and cool the faces, especially with abrasive or corrosive pump mediums, the seal faces will be eroded over time. Proper materials must be selected to be compatible with the pumping medium, and can be expensive. For hazardous or more severe pumpage, a double (dual pressurized) seal may be necessary. In this system, there is essentially no leakage allowed outside the pump. Double seals are far more durable than single seals and may last up to five times longer in this environment. A flushing liquid is required for double seal installations. One method Cornell developed to assist with solids and abrasive applications is our patented Cycloseal® technology. Cornell’s “Run-Dry” System lubricates the mechanical seal and allows the pump to run without pumping liquid. 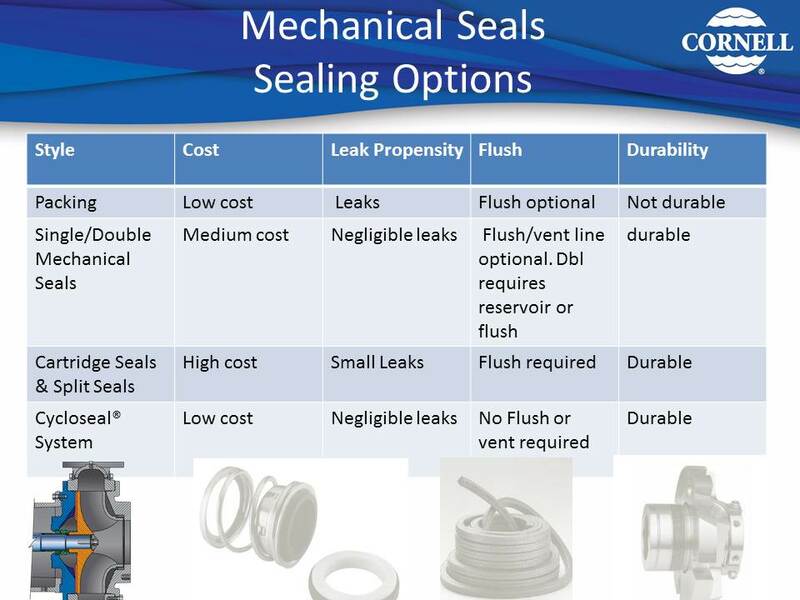 Contact the factory for additional info on these sealing technologies. How well do you know pumps? Take the second in our quiz series to test your general centrifugal pump knowledge! Cornell Pump will be holding our annual pump school in January 2017. We normally hold the school in September, but this year we’re accommodating those who aren’t able to attend because of harvest, etc. The quiz is short—five questions long—and you get the answers immediately. Take the quiz to brush up on your knowledge, or confirm your ability to get five out of five correct! All these topics and much more will be discussed at Pump School 2017. 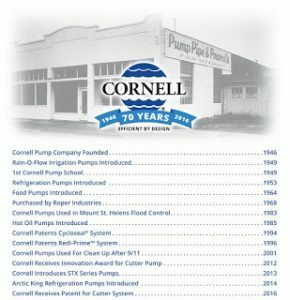 You can learn about pump school and download the registration form on the Cornell website. Pump School is a great value; $175 per attendee, or ONLY $95 if you come as a guest of a Cornell Distributor. Three days, two receptions, meals, giveaways, and TCH-approved learning in one of the most beautiful cities in the country. Make your plans to attend Pump School 2017, January 23-25, 2017; Monday night reception and classes/factory training on Tuesday and Wednesday. 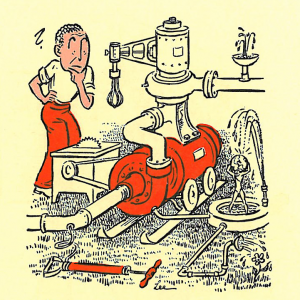 Do you know how to successfully start-up a pump? Cornell Pump sells thousands of pumps each year—and every one of them has to put into service for the first time in the field or at the installation. Pumps also need to checked if they have not been used for a period of time, for instance, after the last growing season. To aid operators, we go over start-up procedures at our pump school. Following is a checklist of activities, in order of action, that we have found will help a start-up go smoothly. Whether you’ve never started up a pump before, or you’re an old-hand at hydraulics, this 18-point check list can help ensure your next pump start-up is trouble free. And, if you’d like more training about start-up and other operation/maintenance related topics, consider attending the Cornell Pump 2017 Pump School. It will be held January 24 and 25, 2017 in Portland, Oregon. 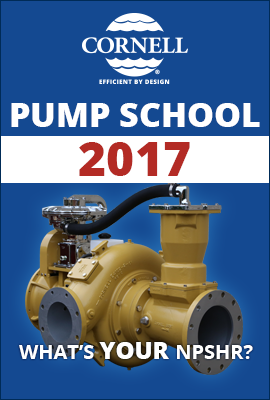 Get more information about Pump School 2017. Re-read all instructions and check for compliance on each point. Piping must be clean and free of debris and obstructions, gaskets in place and all joints secure. Are all thrust blocks and supports adequate? Check the valves and blow-offs for proper position. Make sure support systems are in place and functioning, such as special lubrication, frame oil, etc. Check the power supply voltage with the motor name plate. Are belts and shaft couplings properly adjusted and aligned and guards in place? Does the pump rotate freely? Check pump rotational direction. (VERY SHORT on/off power pulse). Comply with all seal or packing operation and start-up instructions. Note the operating temperature of frame bearings (if any). The pump may be checked for shut-off pressure with the pump performance curve. Do not operate any pump without properly priming it, unless it has been specifically designed for such operation. New pumps must not be started and stopped frequently. If possible, permit the unit to run until operating temperature is reached. NOTE: Large motors must not be started and stopped more than five times per hour. 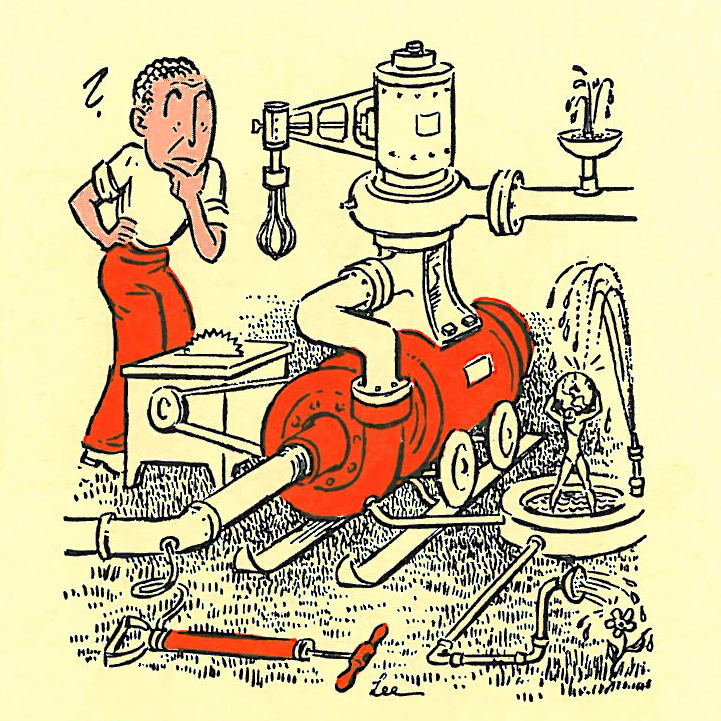 A pump must not be started until compliance is reached on all the applicable points above and any others specified in the “Operation and Maintenance Manual” supplied with the pump. Failure to do so may cause severe damage to equipment and/or personal injury. It may also void the warranty. This is a first in a series about pump-start up considerations. Look for additional articles over the next several days. 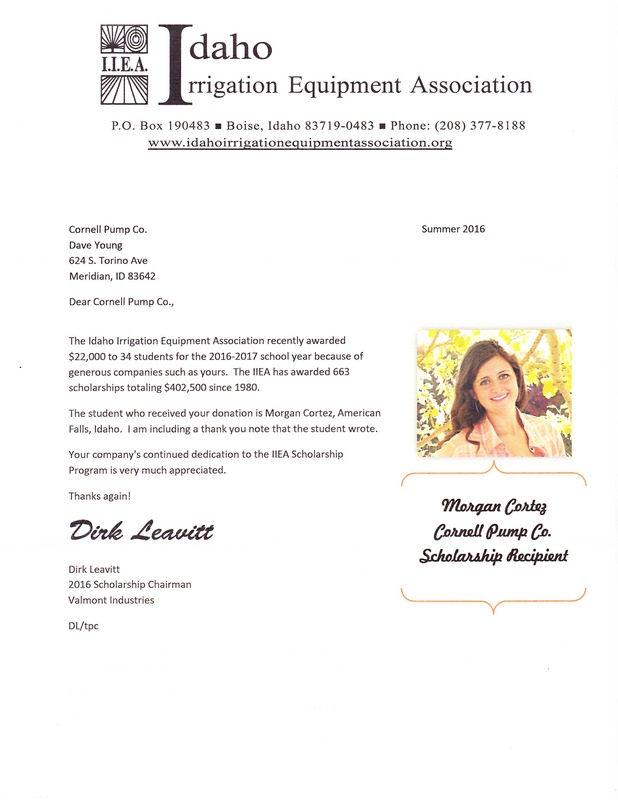 Cornell Pump Company has proudly supported the Idaho Irrigation Equipment Association’s scholarship fund for years. The association recently awarded $22,000 in scholarships to 34 students for the 2016-2017 year. IIEA has given out more than four hundred thousand dollars in scholarships since its inception in 1980. Scholarships are awarded to students interested in the irrigation industry – majors may include: Irrigation Engineering, Agricultural Engineering, Horticulture, Crop and Soil Sciences, Agribusiness, Turf Landscape/Irrigation Architecture and Design, Agriculture/Horticulture Education. 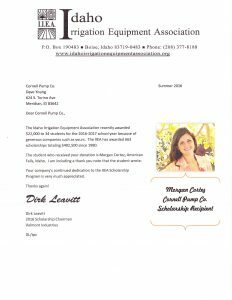 Cornell Pump receive a touching letter from Morgan Cortez, Cornell Pump IIEA 2016 scholarship recipient. 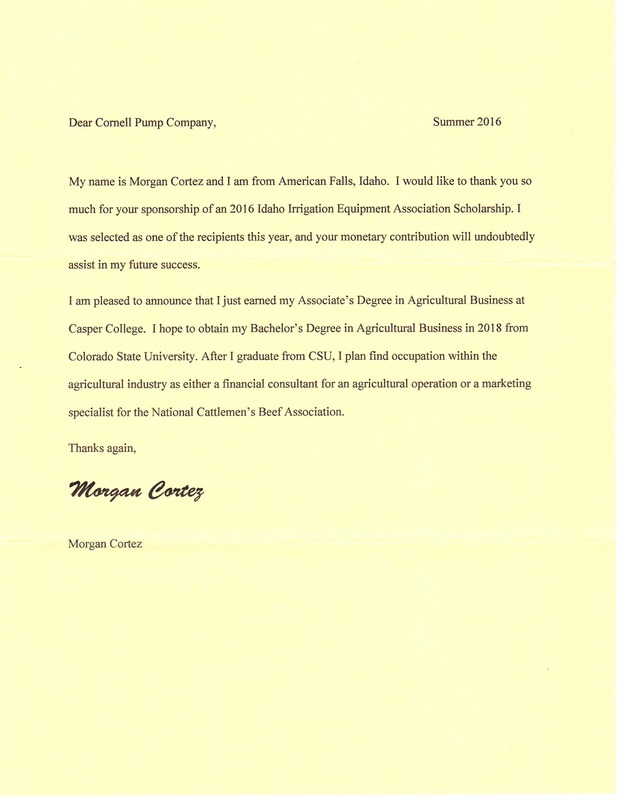 Ms. Cortez indicated the scholarship will help her achieve her goal of an associate’s degree in Agricultural Business at Casper College in Casper, Wyoming. 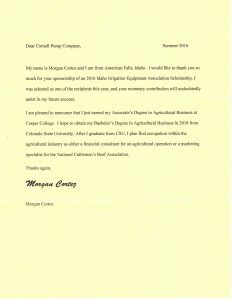 After completing her Associates degree, she will attend Colorado State University for a Bachelor’s degree in Business Agriculture. Congratulations to all the recipients—we hope your aspirations come true! 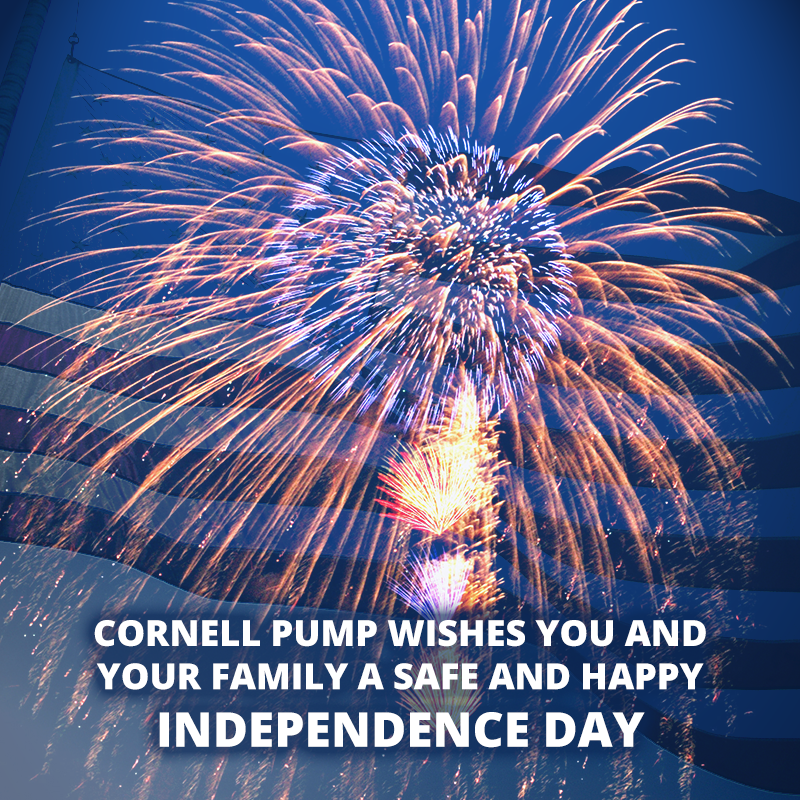 In recognition of Independence day, Cornell Pump Company will have limited capabilities on July 1st, and will be closed on Monday, July 4. We will re-open on Tuesday, July 5th with regular hours. 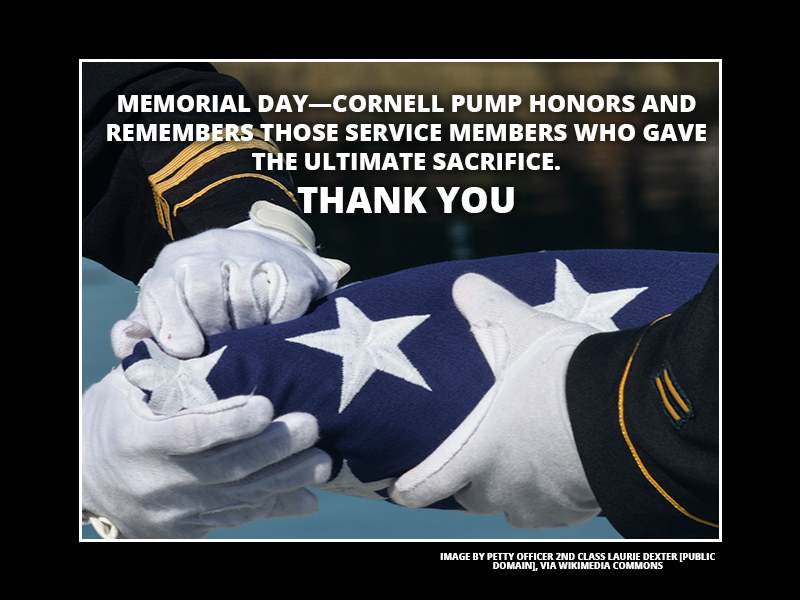 In observation of the holiday, Cornell Pump will be closed on Monday, May 30, 2016. We will re-open on Tuesday, May 31, at 7 am PDT. Cornell Pump Company’s Pump School started in 1949. In that time, we’ve trained tens of thousands of participants on pumps, hydraulics, and ways they can make their pump systems more reliable, and more efficient. We heard from many folks that the traditional time period of Pump School in September didn’t work with their trade show or agricultural schedules, so for 2017, we are offering a JANUARYpump school. Still held in Portland, Oregon, the school offers basic and advanced tracks on topics such as NPSHr/a, system curves, installation and care, slurries, priming systems, and much more. We’ve even created a quiz to get in the spirit of Pump School. Take this short 5 question quiz, and see how well you know pump knowledge that will be covered in Pump School. You can learn about pump school here, and download the registration form here. Pump School is a great value; $175 per attendee, or ONLY $95 if you come as a guest of a Cornell Distributor. Three days, two receptions, meals, giveaways, and TCH-approved learning in one of the most beautiful cities in the country. Make your plans to attend Pump School 2017, January 23-25, 2017; Monday night reception and classes/factory training on Tuesday and Wednesday. 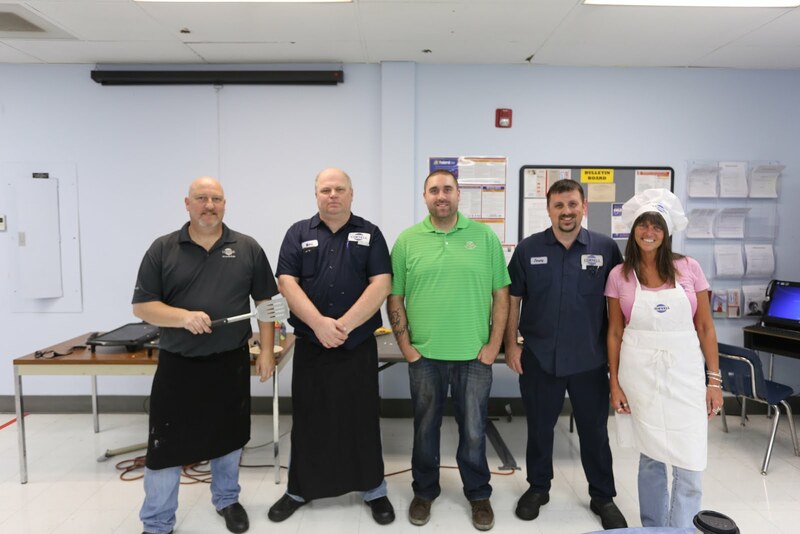 Last week, Cornell Pump held a pancake fundraising breakfast, to benefit the American Cancer Society. 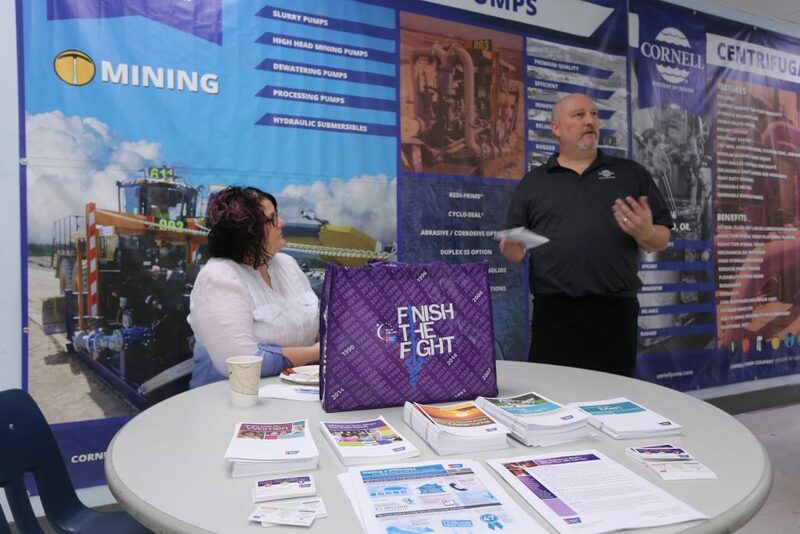 Employees enjoyed pancakes at 7:30 a.m., had an opportunity to speak with a representative of the American Cancer Society, and gather information as part of breakfast. In all, employees donated $852.00 for the breakfast, and Cornell Pump donated $800.00 in additional funds. Organized by the Employee events committee, the breakfast is one of the numerous events that encourage Cornell Pump employees to have fun and get to know each other better in different settings. American Cancer Society information table at the breakfast. 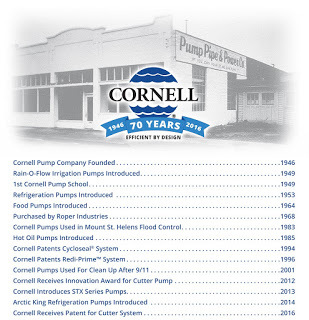 Cornell Pump celebrates our 70th anniversary in May 2016. 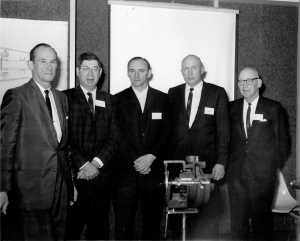 Started in May of 1946, by five friends working in the pump industry, Cornell Pump has grown to an industry leader in terms of product innovation, reliability, and customer satisfaction. More than 100 current Cornell Employees posed for a team photo, wearing commemorative 70th anniversary shirts.